Our semi sweet flourless chocolate cake laced with cocoa nibs is topped with our signature combination of ganache, dark chocolate silk and white chocolate creme brulee cheesecake batter and our truffle cake. These are all blended together then baked slowly to a rich and creamy dessert that is like no other you have had. Our white chocolate creme brulee cheesecake is baked on top of the richest dessert you'll experience. 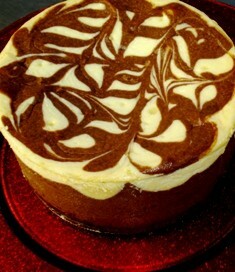 The trifecta cheesecake batter is swirled throughout the top; then this dessert is baked to rich perfection. This dessert will easily serve 16 people...it's "THAT" Rich...how many truffles can you eat at one sitting? This dessert is richer than a truffle!